Slovak President Andrej Kiska is taking “time to think” about Foreign Affairs Minister Lajčák’s resignation. The long-serving pro-European career diplomat, Lajčák said he was stepping down after the Parliament’s refusal of the UN migration compact last week. EURACTIV Slovakia reports. The foreign minister decided to resign on 30 November, after Parliament adopted a resolution to refuse the Global Compact for Migration, the document Lajčák had helped to put together as president of the United Nations General Assembly in 2017. After a meeting on Tuesday (5 December) between the president, Lajčák and Prime Minister Peter Pellegrini, Kiska said he would take some time to think about the decision. The president explained that he supports the minister and wants Pellegrini and Lajčák to further negotiate about the resignation. Lajčák was supposed to chair the upcoming presidency of the OSCE (Organisation for Security and Cooperation in Europe) that Slovakia will take on 1 January. Pellegrini spent the last week trying to get Lajčák to reconsider his decision, saying Lajčák was a world-class diplomat needed for the OSCE presidency. These words came after the vote in the Parliament, where even the ruling SMER – Social Democracy party – voted for the resolution, even though it was that party that had nominated Lajčák for his position and was trying to convince him to run for president in next spring’s election. Lajčák previously announced that he would resign from his post if the resolution was accepted. On Tuesday, the government decided that not only Slovakia would not ratify the migration compact, but no Slovak representative should attend the conference in Marrakesh. Pellegrini confirmed that Slovakia will not attend the Marrakech conference. Instead, he will send a letter explaining Slovak concerns. Lajčák did not comment on the results of the meeting and left presidential palace in silence. The whole issue started about a month ago with a debate on whether Slovakia should accept the UN’s Migration Compact. Centre-stage in the debate was quickly taken by Slovak National Party (SNS), a coalition member whose leader Andrej Danko sees authoritarian leaders such as Viktor Orbán or Jaroslaw Kaczynski as his idols. After it became clear that neither Austria nor Hungary will attend the Marrakech conference, Lajčák expressed his full support for the document. Such statements quickly became the target of criticism from SNS and We Are Family, a populist, right-wing opposition party. Soon, the anti-pact rhetoric was also adopted by the two biggest parties, the ruling SMER party and the opposition Freedom and Solidarity. SNS then demanded that no representative should attend the Marrakech conference, and this was supported by the previous Prime Minister Robert Fico, the leader of SMER who stepped down in March in the face of heavy protests following the murder of journalist Ján Kuciak and his fiancée Martina Kušnírová. Fico even published a video on his Facebook profile where he said the document was not in compliance with national migration policy. Both Pellegrini and Fico said they would do everything in their power to keep Lajčák in his post. The loss of a skilled diplomat could be a huge blow to Slovak ambitions in the upcoming OSCE presidency. 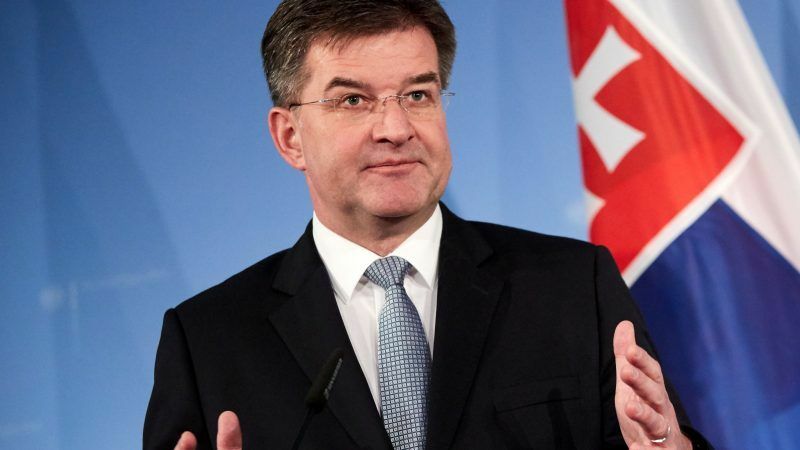 After meeting Pellegrini on Monday, the OSCE Secretary General Thomas Greminger stated that he wished Lajčák would reconsider his resignation and chair the presidency.